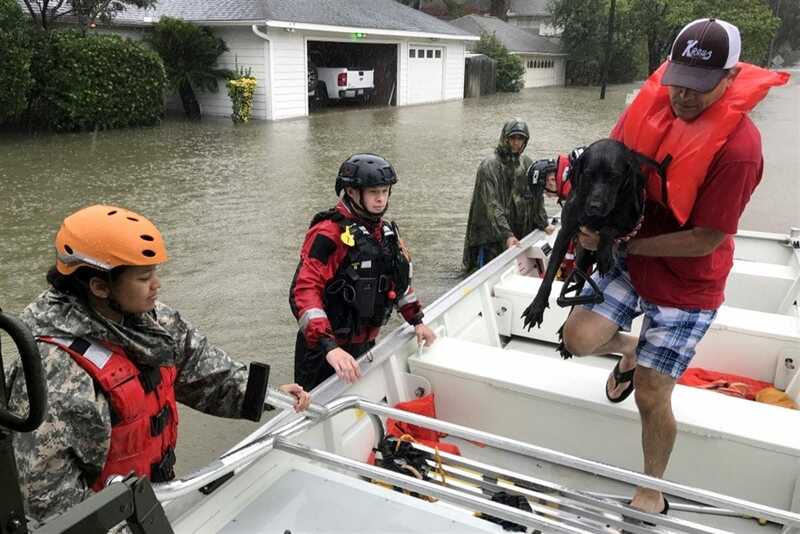 Scott Olson/Getty ImagesPeople are rescued from a neighbourhood flooded by Hurricane Harvey in Houston, Texas, August 28, 2017. Climate change threatens to exacerbate extreme weather events like flooding and heat waves. Such weather events pose a significant threat to the military, which has bases all over the world, and the Pentagon has deemed climate change a severe risk. 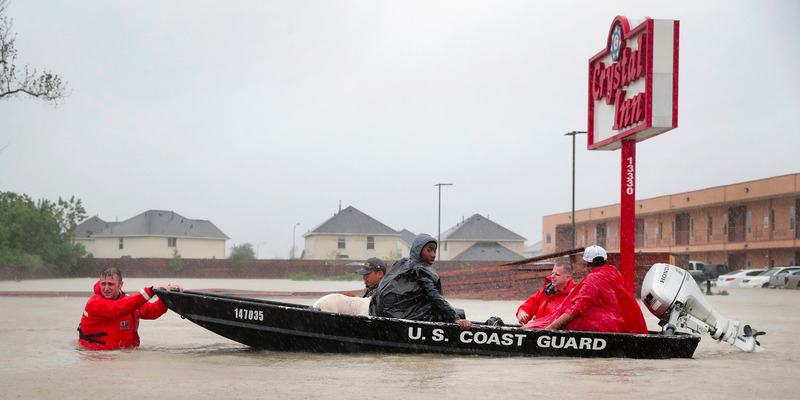 According to the US Coast Guard commandant, the US military and public still has work to do to adapt to a changing climate. Extreme weather events like heat waves and droughts – the most common ways many people experience climate change – have wracked the US in recent years. The US military has identified climate change and related events as a major national-security risk – an assessment also made by former President Barack Obama. President Donald Trump’s recently released National Security Strategy emphasises energy dominance over concerns about climate change. The issuance of that strategy came just a few days after Trump signed the 2018 National Defence Authorization Act, which called climate change a “direct threat” to national security. The US military, which has hundreds of facilities at risk from climate-change-related effects, is already preparing. Defence Secretary Jim Mattis told a Senate committee in January that climate change “is impacting stability in areas of the world where our troops are operating.” Mattis has long said the military should reduce its dependence on fossil fuels, and senior officials in the Air Force and Marine Corps said earlier this year that they expected the military’s work toward renewable energy to continue under Trump. For Coast Guard Commandant Adm. Paul Zukunft, the need to adapt to the effects of climate change, sea-level rise in particular, goes beyond the military – but the US is already behind. “I’ve made it an imperative on my watch to see first-hand what is happening in the high latitudes,” Zukunft, who took over the service in May 2014, told Defence & Aerospace Report last week. The Jakobshavn glacier, a major outlet for Greenland’s ice fields, has retreated 25 miles in the past five years after being static for more than a thousand years, Zukunft said. Between 2000 and 2011, the ice loss through Jakobshavn alone caused a millimetre increase in the global sea level. Other countries vulnerable to sea-level rise are preparing, Zukunft said. He cited the Netherlands, which has started building infrastructure and levelling taxes to fund resiliency. Zukunft also pointed to behaviour after Hurricanes Irma, Maria, and Harvey – which he said caused just under a billion dollars in damage and affected Coast Guard readiness and infrastructure – to underscore the US’s lack of preparation. Those three hurricanes also wreaked damage throughout the Caribbean, exacerbating insecurity in one of the most dangerous regions of the world. US Army/Capt. Martha NigrelleTexas Guardsmen, first responders from Texas Task Force One, and the Cypress Creek Fire Department move residents from severely flooded neighbourhoods days after Hurricane Harvey in Cypress Creek, Texas, August 28, 2017. “Out in Hampton Roads, Virginia, across from Old Dominion University [is a] very upscale neighbourhood called Larchmont,” Zukunft added.”Well, the property values are sinking because the land is sinking, [and the] ocean is rising. They have got standing sea water in those streets during high tides, and just up the street from there is the largest naval base in the world,” he said, referring to Naval Station Norfolk. 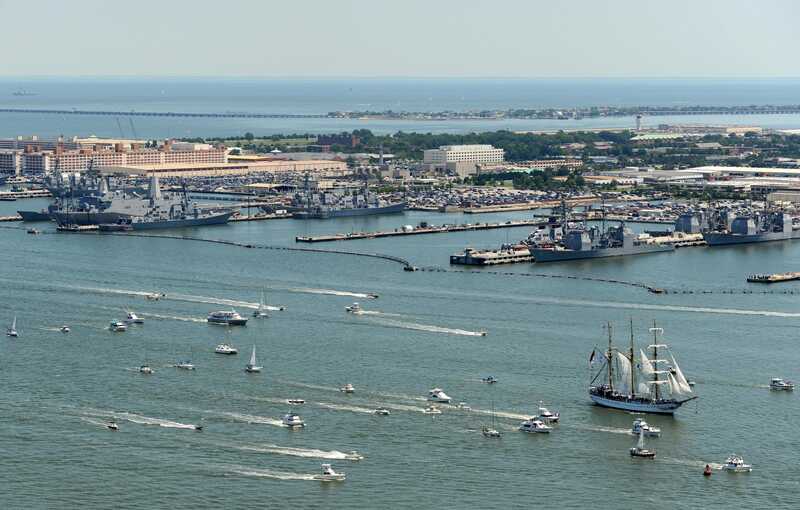 Naval Station Norfolk is one of 128 US military facilities that would be threatened by a 3-foot rise in sea levels. 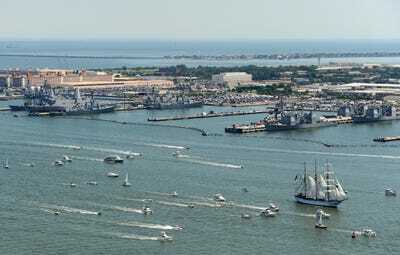 US Navy/Mass Communication Specialist 2nd Class Bryan WeyersShips taking part in Operation Sail in Norfolk, Virginia. The base at Norfolk and 17 other military facilities on waterfront property – including the Marine Corps base at Parris Island in South Carolina – are at risk of hundreds of floods a year and could be under water by 2100, according to a mid-2016 study by the Union of Concerned Scientists. Some of those bases have already responded to the risks – a 2014 Pentagon report cited Hampton Roads specifically as an area of concern. This spring, Trump rescinded Obama’s climate-related orders for federal agencies, but the Defence Department has continued working on an Obama-era plan to address climate change, largely by focusing on threats from specific events, like extreme seas or flooding, rather than larger debates about climate change, according to Military Times.